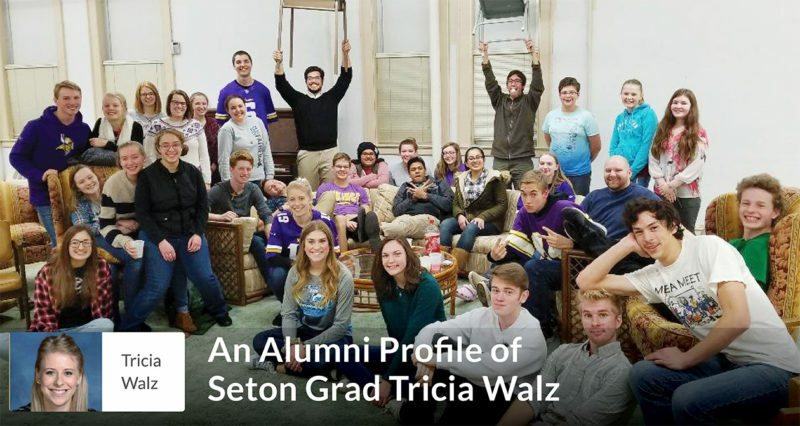 Seton Home Study School and Benedictine College graduate Tricia Walz’s passion is helping youth build strong Catholic friendships and grow in their faith. How long were you homeschooled through Seton, and what did you like about the experience? Where did you go to college, and what is your degree? How did your Seton education help you navigate the college experience? What gives you passion or motivation in your current occupation? Any advice for current Seton High-Schoolers? I was homeschooled my last two years of high school. I loved the flexibility and the faith component of Seton. I started Seton at a point in my life when my faith was beginning to become my own, so learning about what the Catholic Church believes was vital! I attended Benedictine College in Atchison, KS, and majored in both Biochemistry and Chemistry. I failed my first 2 or 3 English papers when I started Seton and I remember being so upset! In the public school, I never had below an A in English. Looking back at it now, I am so grateful for Seton’s “tough love” because in college I could write papers so easily whereas a lot of my peers were struggling. During the day, I work at a medical device company called Medtronic and in the evenings, I volunteer with high school students in our diocese. I recently published a book titled “By His Mercy” which is a compilation of testimonies from young adults in the St. Cloud, MN area on how we have seen God’s mercy in our lives. I find my passion with helping the youth grow in their faith and build good strong Catholic friendships and connections. I find myself longing for Sunday nights when our youth group gets together. Seton is hard, it really is, but I found myself leaps and bounds ahead of my classmates in my freshman year of college. It is worth all the hard work!! As far as life goes: God has big plans for each and every one of you, so trust in Him and never lose faith! He may ask you to do something crazy or that you wouldn’t have expected, but trust me when I say it will be worth it!